Always check that the bonnet is closed and securely locked: A bonnet that is not closed and securely locked is dangerous as it could fl y open while the vehicle is moving and block the driver's vision which could result in a serious accident. 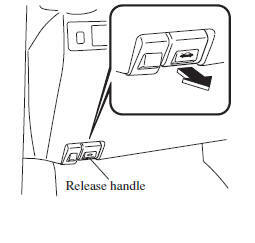 With the vehicle parked, pull the release handle to unlock the bonnet. 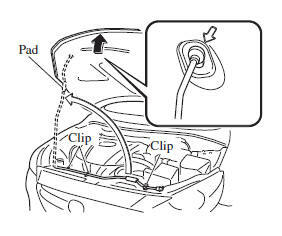 Insert your hand into the bonnet opening, slide the latch lever to the right, and lift up the bonnet. Grasp the support rod in the padded area and secure it in the support rod hole indicated by the arrow to hold the bonnet open. Check under the bonnet area to make certain all fi ller caps are in place and all loose items (e.g. tools, oil containers, etc.) have been removed. 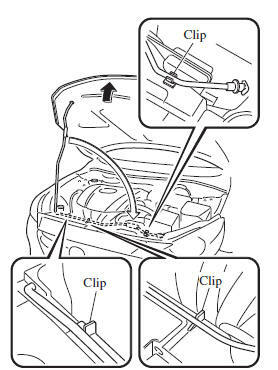 Lift the bonnet, grasp the padded area on the support rod, and secure the support rod in the clip. Verify that the support rod is secured in the clip before closing the bonnet. Lower the bonnet slowly to a height of about 20 cm (7.9 in) above its closed position and then let it drop. When closing the bonnet, do not push it excessively such as by applying your weight. Otherwise, the bonnet could be deformed.